Abies koreana ‘Siberlocke’ This handsome selection of the Korean Fir displays needles that curl up to reveal undersides of startling silvery-white. Form is upright, densely conical, sometimes attractively irregular. Slow growing, possibly reaching 30’ after many years. Maintains a dense, full habit throughout its life. Outstanding, rich purple cones in spring add yet another ornamental feature to this amazing plant. Zone 5. Cephalotaxus harringtonia ‘Fastigiata’ 2” long, glossy dark green, yew-like needles whorled around upright stems. Grows moderately slowly with a broad columnar form, eventually reaching around 10’ high. Widens with age but can easily be kept in an upright form through periodic pruning. Excellent textural interest with handsome foliage that always gets a second look. Shade tolerant and, once established, tolerant of dry situations. Deer resistant. Zone 6-5b. nootkatensis ‘Green Arrow’ A very narrow habit with a strong central leader and downward sweeping branches held tight to the trunk, resulting in a form that in 10 yrs will be 15'-18' tall and only 2' wide. Slow growing, and even when mature, plants do not exceed the relatively low hight of 25'-35' tall, with a width of only 5'-8'. An eye-catching exclaimation point with high landscape impact. Where space allows, group plantings are especially effective. For sun, with rich, evenly moist but well-drained soil. Becomes more drought tolerant as it matures. Slow growing. nootkatensis ‘Sullivan’ Handsome dark, bluish green fans carried on gracefully drooping branches impart a soft, light appearance . Develops a relatively narrow cone shape to 25’-30’ high at maturity. Requires an evenly moist soil. Suitable for specimen/accent use where a smaller evergreen presence is desired. Also good for hedging and for use in places that might be too moist for other trees/shrubs. Zone 5.
obtusa ‘Confucius’ Bright golden-yellow foliage shimmers at the ends of the branches against dark, emerald-green, interior foliage, creating a pleasing two-toned effect. Habit is upright, narrow, growing moderately fast to reach 12’-15’ high by 6’-8’ wide in 10-15 years. Effective as a specimen, creating strong accent anywhere in the landscape, also adds excitement shrub borders. For rich, evenly moist, well-drained soil. obtusa ‘Coralliformis’ Semi-dwarf with curious dark green, threadlike foliage that twists in every direction. Habit is prostrate when young, eventually building into an upright form reaching around 30 ins. in 10 yrs., and, after many years achieving a height of 5 ft. Zone 4.
obtusa ‘Crippsii’ An upright, pyramidal, large shrub to small tree with graceful horizontal branches lined with fan-like fronds, brilliantly yellow at their tips, becoming gold then bright chartreuse toward the core of the plant. Grows slowly, eventually becoming broadly conical, 15ft. high by 8ft. wide with wide-spreading branches that droop flirtatiously at their tips. Impressive as a lawn specimen or for dramatic accent in the shrub border. Zone5. obtusa ‘Fernspray Gold’ Dense and broadly upright/slender, decidedly not low-growing or globe -shaped, with excellent gold foliage that holds up year round. 10ft. tall after many years. 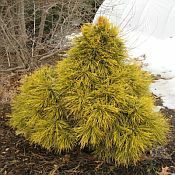 Its upright, slender habit and persistent gold color make it desirable for many landscape situations, especially for accent and specimen use and for adding year round color and textural interest to the mixed deciduous/conifer border. Zone 5.
obtusa ‘Filicicoides’ A small, open-growing bush with long thin branches and flat, fern-like foliage. In time will reach 5' in height. obtusa ‘Gracilis’ Deep green, fan-shaped foliage and handsome pyramidal form make this dependable evergreen an excellent choice for hedging, foundation planting and especially for specimen accent. Grows slowly to moderately fast, eventually reaching 30' -40’ tall by 15’-30’. wide. A very distinctive and popular evergreen that becomes the focal point in any landscape. Zone 5.
obtusa ‘Gracilis Select’ This "select" form of Hinoki Falsecyparis exhibits a fuller shape, greener color and a slower growth rate as compared to 'Gracilis'. Moderately fast growing with10 year old plants being 5' high and mature specimens, after many years, reaching 30'. Form is generally pyramidal with rich, green, fan-like foliage sprays growing in various vertical and horizontal planes displaying what many consider to be the real Japanese effect. Zone 5.
obtusa ‘Kosteri’ A robust, broad/upright form with bright green, interestingly contorted foliage that gives it a unique look and sets it apart from other obtusa types. Very slow growing to a mature height of 4-5' in many years. Benefits from reasonably consistent moisture and a position out of winter wind. Excellent for specimen/accent, for use in mixed perennial and shrub borders, and, its smaller size makes it an excellent choice for use in foundation plantings. obtusa ‘Marian’ New 2019 Soft yellow foliage in a narrow, upright form with foliage that whimsically twists and turns adding character and a sense of rebellion to this architecturally pleasing, dwarf shrub. 6’ tall after twelve years. Contrasts beautifully against green foliaged evergreens. Makes an eye-catching accent/specimen, and is small enough for strategic placement in mixed herbaceous borders. Also very nice in decorative containers. Zone 5.
obtusa ‘Nana’ Very slow growing to about 3ft. in height with a slightly broader spread. Differs from o. ‘Nana Gracilis’ in being smaller, slower growing and in having a flat-topped, dense, layered form at maturity. Suitable for rock gardens, ornamental containers and troughs and as specimens. obtusa ‘Nana Gracilis’ One of the best and most sought after dwarf conifers. This dwarf form of 'Gracilis' assumes a dense globe shape when young but with age becomes more upright with many tiers of layered foliage. After many years, mature plants will be no more than 3’- 4' tall. Used in gardens for over a century and still universally admired. obtusa ‘Nana Lutea’ Similar to o. ‘Nana Gracilis’ in having a broad globe shape when young but becoming more upright, generally taller than wide at maturity. The similarity stops there as ‘Nana Lutea’ displays bright golden sprays that are somewhat cupped and up-facing. Very handsome year round. Mature height is 4’-6’ tall. Best placed in bright light without direct exposure to hot afternoon sun. Chamaecyparis obtusa ‘Night Light’ New 2018 Dense compact, upright growth habit displaying attractive green foliage highlighted with yellow to golden coloration at the tips of the branches when grown in full sun. Resists sun and winter burn, and displays golden bronze winter color. Excellent bright, consistent coloration. 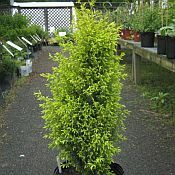 Matures into a full, upright evergreen shrub. Excellent performer with low maintenance! Not dwarf. At maturity, 40-50’ tall by 10-20’ wide. Best color in full sun with rich, evenly moist soil. obtusa ‘Spiralis’ Displays a growth habit similar to 'Nana Gracilis but is much slower growing. In addition, 'Spiralis' differs from 'Nana Gracilis' in being noticeably upright and in having finer, more tightly held foliage. After many years, plants will mature at 3' tall and 2' wide. obtusa ‘Sunny Swirl’ New 2018 Shines in the landscape with illuminating blends of gold and chartreuse on twisting, threadlike foliage. The upright and uniquely contorted mahogany red branches provide striking contrast to intensely colored foliage, adding to the overall garden appeal of this handsome, slow growing, dwarf evergreen. Slow growing, reaching only 6-8’ tall by 4-5’ wide. obtusa ‘Thoweil’ Dwarf, reaching a mature height of only 4-6’ tall by 1-2’ wide after many years of annual increase of 3” per year. Foliage is small, held close on a unique, upright, sculpted form. Very distinctive as accent/specimen and perfect for adding vertical accent to rock gardens where low, prostrate forms often hold sway. Also, it’s a natural for container culture, retaining its distinctive shape for years without the need for potting-up. Zone 5. May availability. obtusa ‘Verdoni’ Densely packed, golden-colored fronds on compact upright cone-shaped plants. Slow to medium growth rate, eventually reaching 10ft. high by 4ft. wide. 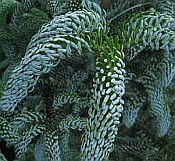 A handsome evergreen, distinctive for its tightly held fronds that resist winter sunburn. Zone 5.
pisifera ‘Juniperoides Aurea’ Dense, compact, broad conical habit with fine-textured foliage that begins spring as bright yellow and slowly changes to chartreuse through summer. Only 2’-3’ high after ten years and, after many years,( 20 yrs. ), maturing at anywhere from 6’-12’. The yellow/chartreuse color and fine texture contrast beautifully with the deep green cultivars of Chamaecyparis obtusa and the smaller growing, blue cultivars of Picea pungens. Stout, upright, slightly tapering form makes a strong statement in rock gardens, mixed conifer plantings and in mixed perennial borders. Effective accent almost anywhere in the landscape, in sun, with evenly moist, well-drained soil. pisifera ‘Mini Variegata’ Dwarf, 2'- 2½' tall by 2'-3' wide formig a dense rounded mound of gray/green foliage splashed with creamy white highlights. Recommended for accent, for low hedging and for mixed perennial borders to lend year round interest. 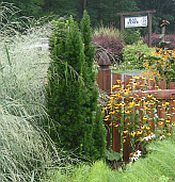 Adds sharp texture and color contrast to mixed conifer plantings. Deer resistant. pisifera Soft Serve® Compact and slow growing with a conical form and soft, fern-like foliage that's bright green on top and flecked with silver-blue on the underside. A sport of C. 'Boulevard', 'Soft Serve' retains some of the great texture of it's parent with none of the disease problems that can plague that selection. Grows 6-8' tall with a neat, conical form and soft, "touchable" foliage that requires little pruning. Recommended for hedging, for specimen planting and makes a good substitute for the Dwarf Alberta Spruce. 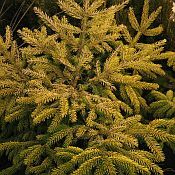 Zone 5.
pisifera Soft Serve® Gold New 2019 A new compact, pyramidal false cypress, with graceful, bright golden, fern-like foliage. Hardy and burn resistant, this small evergreen is a gold version of the original Soft Serve® chamaecyparis. 6-10’ tall. Deer resistant. Zone 4.
pisifera ‘Tsukumo’ Tiny, tight, muffins of dense green foliage, only 1½’ tall with an equally modest spread of 1½’. One of the best dwarf conifers for rock gardens and troughs, and one of the ” touchables” that almost always gets a gentle pat from garden visitors. Zone 4.
thyoides ‘Glauca’ To 10’ tall, up to 12’, with a compact, broad-upright, columnar form with vivid, silver-blue foliage that assumes attractive purple/bronze shades in winter.. Grows at a moderate rate, looking somewhat unkempt when young but eventually falling in line to form a handsome small to medium sized, columnar-shaped conifer. Slower grower than the species. Best in full sun with evenly moist soil. Our plant of many years is perfectly happy in well-drained, silty/sandy loam. Native. Can be seen in large groves in wet areas on Cape Cod, Massachusetts. Lends effective contrast to green and yellow foliaged conifers and looks sharp when mixed with diciduous shrubs. Attractive enough for specimen use. Juniperus chinensis ‘Spartan’ New 2019 A handsome, narrow, upright evergreen offering a densely branched habit with vivid, dark green foliage. At 15 -18’ high by only 4-5’ wide, it’s a great candidate for hedging or border groupings and for narrow, vertical accent throughout the landscape. Tough, drought resistant, and reliable. Provides great nesting cover for birds. Deer resistant. Zone 4. 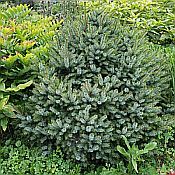 Handsome, upright evergreen offers densely branched habit with vivid, dark green foliage. Needle-like foliage and pyramidal form is great for wide range of landscape uses. Tough, drought resistant, and reliable. A great candidate for hedging or border groupings. Attractive vivid, dark-green foliage. Excellent nesting cover for birds. Juniperus communis ‘Compressa’ Upright, cone-shaped with blue-green evergreen foliage. Slow growing, with dense, vertical branching, maintaining a very narrow form, 2’-3’ tall by 1’(or less) wide. Suitable for rock gardens and especially nice for creating the illusion of a “forest” in miniature gardens. Imparts effective vertical accent, especially in groups, and should be used in strategic locations to take advantage of this feature. Tolerates dry, infertile soil, in full sun. Zone 2.
communis ‘Gold Cone’ Tight, dense and slow growing, this columnar Juniper is ideal for many landscape uses. Foliage is a superb gold color on plants that grow only 3-4ins. per year, maturing at 6-7ft. high by 2-3ft. wide. Thought to be the best of the yellow-needled columnar types. Retains its color through summer with a minimum of fading. Grow in full sun, in well drained soil. Zone 5. Good Vibrations® Gold (horizontalis) New 2018 Unlike other junipers, this beauty is soft to the touch. Seasonal color changes add to its appeal as spring foliage emerges chartreuse, changes to bright yellow in summer and takes on orange hues in the autumn. 1’ tall by 7-9’ wide, drought tolerant and deer resistant. Zone 3.
horizontalis ‘Mother Lode’ A unique sport of ‘Wiltonii’ that’s completely bright yellow in summer without a speck of green, turning deep gold and salmon-orange with green overtones in winter. Slow growing but not fragile, thoroughly capable of holding its own in any full sun location with excellent drainage. Warrants a prominent spot in the garden where it can be seen and enjoyed year round. Only 4-6ins. tall with slow, modest spread. Zone 3.
procumbens ‘Nana’ This is the true selection of 'Nana' which, in increments of 2-3" a year, forms a low, ground-hugging mat looking somewhat like rough textured moss. 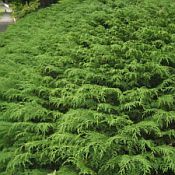 A choice, dwarf conifer especially useful as a modest groundcover, in the rock garden, in collections of dwarf conifers, and for bonsai. Grow in full sun in well drained soil. Zone 4. Larix dicidua ‘Pendula’ See under Shrubs. Larix dicidua ‘Pendula’-prostrate form See under Shrubs. Microbiota decussata (Russian Arborvitae) A needled evergreen shrub that reaches a mere 12ins. in hight but spreads moderately quickly to a width of 12-15ft. Habit is very symmetrical, with nicely layered foliage forming a neat, wide, evenly rounded mass. Great ground-cover potential! Plants closely resemble junipers but, unlike juniper, will tolerate, indeed prefer, moist but well-drained soil. Needles turn burgundy in winter, much like the low, ground hugging junipers. For sun to light shade with good, reasonably moist but well-drained soil. Zone 2. Microbiota decussata Celtic Pride All the great qualities of the species,- low, wide spreading habit that forms a neat, very symmetrical, blanket of evergreen foliage, 1'-2' tall by 6' wide. Celtic Pride improves on the species by showing superior disease resistance and better winter color. Great ground-cover potential! Plants closely resemble junipers but, unlike juniper, will tolerate, indeed prefer, moist but well-drained soil. For sun to light shade with good, reasonably moist but well-drained soil. Zone 2. Picea abies ‘Lemonade’ New 2019 Description to be posted. Picea abies ‘Pendula’ Although slow growing when young, 'Pendula' will eventually develop into a large eye-catching specimen. All branches are pendulous and, unless staked, plants will simply maintain a prostrate, trailing form. Both the vertical and prostrate forms are attractive. The stake that was supporting our plant deteriorated several years ago and was never replaced resulting in the plant you see in picture. Still upright and looking super interesting! Picea mariana ‘Cape Bretton’ An upright, very wide, finely textured Spruce. Very compact, and when at about 2' high and 18" wide it tends to form into the shape of a tear drop. Slow growing and, even after many years, still not growing much beyond the above dimensions. New and unique looking in a way that sets it apart from all other dwarf Spruce! Hardy to zone 2 with a preference for evenly moist soil. Full sun. The original plant was found on Cape Breton Island. 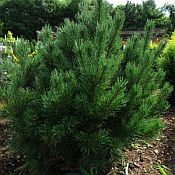 mariana ‘Ericoides’ (Dwarf Black Spruce) Low and wide growing,(18ins. high by 30ins. wide), with tiny, densely packed blue-green needles. Somewhat similar to the Bird’s Nest Spruce but more dense and with deeper blue color. Very rugged plants that thrive in sun, in moist, acid soil. Zone 2. Picea omorika ‘Nana’ One of the best dwarf conifers, broadly conical with needles that are green on top and glaucous underneath creating a striking two-toned effect, densely packed on the stems. 3ft. tall in ten years and, after many years, maturing to 8-10ft. Zone 4. Picea omorika 'Pendula' (Weeping Serbian Spruce) A distinctive evergreen with strongly weeping, drooping, slightly twisted branches. Needles are blue/green. An especially beautiful habit that sets it apart from other weeping conifers. Can reach 50’ high at maturity. Picea orientalis ‘Aurea’ A beautiful dwarf Spruce with a habit similar to 'Nana' though somewhat more open. Form is dense, upright, broad pyramidal with short, tightly packed golden yellow needles. Slow glowing, reaching 6-8' in 20 years. 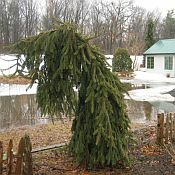 To get an idea of what this conifer looks like, check out the picture of 'Nana' below and imagine it with gold tipped branches. 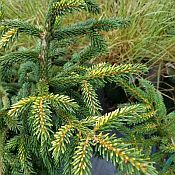 Picea orientalis ‘Aureaspicata’ Very showy, bright, lemony-yellow, new growth glows at the branch tips in spring. The yellow new growth contrasts brilliantly with the older, dark green needles and maintains the eye-catching show for six weeks before turning all green. Terrific for accent in larger spaces such as in the middle of open lawns and in large mixed shrub and evergreen borders. Large enough to be appreciated from a distance. A graceful, large evergreen with magnetic appeal! Expect 15’ or more in ten years and twice that height by maturity. Many authorities consider ‘Aurea’ and ‘Aureospicata’ to be one and the same plant or at least so similar that separating the two come down to splitting hairs. Picea orientalis ‘Nana’ A dense, compact, dwarf spruce with a neat, broad pyramidal form, wide at the base and tapering gradually to a point. Needles are short, very dark green and thickly packed on the branches. Mature height is 3ft. tall with a very appealing tight, symmetrical silhouette. Could be use in foundation plantings, certainly as a rock garden specimen, or, among perennials in the mixed border. Zone 4. Picea pungens ‘Glauca Globosa’ (Dwarf Colorado Blue Sprure) Young plants have an irregular, flattened globe shape, gradually pulling themselves together into a compact, broad pyramid. 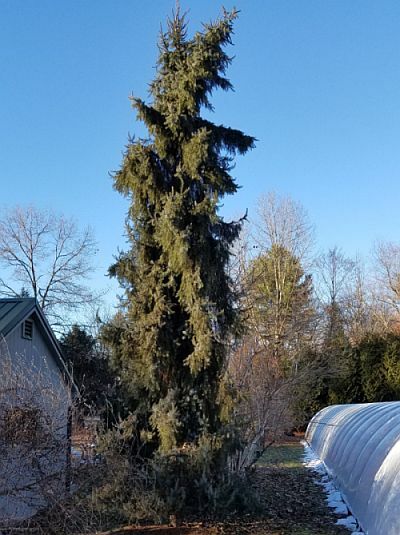 Slow growing, at a rate of 3"-6" per year, after many years, reaching a height of 3'-4' Very similar to and often mistaken for Picea pungens 'Montgomery'. Both are nice and you can't go wrong with either. We've had what we feel is 'Glauca Globosa' in our border for going on 12 years and it's barely 3' tall by 4-5' wide. Zone 3. Pinus banksiana ‘Al Johnson’ New 2019 A unique form of Jack Pine, growing to only 2-3’ feet high in 10 years. Form is open, irregular, highly architectural. An excellent choice for rock gardens and dwarf conifer collections. Just about indestructible. Very hardy, zone 2.
koraiensis ‘Glauca’ Upright/pyramidal when young, maturing to a more rounded/oval shape though always remaining taller than wide. Branches are retained to the ground. Needles are long, thick, blue/green in color and soft to the touch. Classified as intermediate/large, reaching around 10’ in ten years and possibly up to 30’ in many years. A handsome pine recommended for accent/specimen. Prefers sun and evenly moist, well-dained soil. Zone 4.
flexilis Cesarini Blue€ New 2019 (Limber Pine) A small, upright, compact cultivar with the bluest needles found on any of the P. flexilis selections. Needles are commonly described as being powdery blue. This is a narrow pyramidal tree that typically grows very slowly to only 6-7' tall by 3' wide in 10 years, eventually reaching 20-25’ after many years. For full sun. Best in evenly moist, well-drained soil, though plants do show some adaptability to drier conditions. A very handsome smaller growing conifer with the duel assets of a narrow, upright habit coupled with distinctive blue needles. As the specie name implies, branches are flexible, enough so that they can be tied in knots,(not recommended). Native. 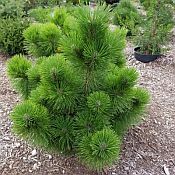 Zone 4.
leucodermis (Bosnian Pine) Slow growing, medium sized, with a neat, pyramidal, densely branched habit, 30’ high. All branches have a distinct, up-facing orientation. Dark green, 2½” long needles encircle the stems at a sharp angle, uniformly pointing up toward the stem tips. In spring, attractive white candles appear at the stem tips. The greenish gray bark on mature plants adds to the appeal of this handsome pine. Very suitable as a focal point, accent/specimen subject, especially in dry, high pH locations. Native to Albania, Greece, Italy and Yugoslavia. Zone 6.
mugo mughus ‘Rock Garden’ (Mugo Pine) All mugos are not alike and many unsuspecting gardeners, thinking they were buying a dwarf, have watched in horror as their plants morphed into 30' green monsters. Admittedly, a 30' Mugo Pine is a beautiful sight, unless it has been wedged into a space meant to hold a 2' plant. 'Rock Garden' is vegetatively propagated from known dwarf stock, and will remain dwarf. Zone 3.
mugo ‘Slowmound’ Forms a dwarf, uniform carpet of upward-facing branches, 3ft. high at maturity. Needles are 2ins. long and interestingly twisted. Looks great in the rock garden, in mixed conifer plantings and even in foundation plantings. There is always some uncertainty when it comes to figuring the ultimate size of some Mugo Pine but you can always be sure that 'Slowmound' will be a predictable dense, compact mound that is perfectly suited for foundation plant groupings and small space gardening. .Zone 3.
nigra ‘Hornibrookiana’ Slow growing, very compact, dwarf, only 3’ tall by 6’ wide in 30 yrs. 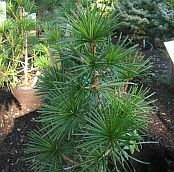 Stiff, glossy, dark green needles,(2½” long), encircle showy, cream colored candles in spring. Form is a rounded, uniform construction of stout, thickly placed branches, twice as wide as tall at maturity. Impressively tolerant of a range of soils, acid and alkaline, tolerates seaside conditions. Withstands heat and droughty periods and puts uo with city conditions better than most other pines. An excellent choice for just about every landscape situation, specimen/accent, perennial and shrub borders, rock gardens, foundation plantings. Zone 3.
parviflora ‘Aoi’ Blue/grey, straight needles,(not curving and twisting like most other parvifloras). Form is narrow, upright, very architectural, 15’ high by 8’ wide afer 10-15 yrs. Makes a dramatic statement in the landscape. Zone 5.
parviflora ‘Bergman’ #? A dwarf Japanese white pine growing 2" a year to form a broadly upright silhouette. Needles are short, silvery blue and attractively twisted. In spring, bright red cones encircle the elongated branch tips. Its small size, distinctive foliage that remains attractive year round, plus the eye-catching bright red cones in spring make 'Bergman' an excellent choice for specimen placement, for foundation plantings, for conifer colections and for rock gardens. Perfers well drained soil with full sun. Zone 5.
parviflora ‘Gimborn’s Ideal’ 10’ tall in ten years and up to 25’ high in many years with a habit that’s dense for a P. parviflora. Taller than wide with outstretched, ascending branches imparting a somewhat irregular, “jagged” silhouette. Appears more “groomed” than many other Japanese White Pines. Short, blue/green, twisted needles. Tolerant of seaside conditions,(salt), and needs reasonably moist but very well drained soil. Very desirable. Retains enough of the windswept look to stir the imagination. parviflora 'Glauca Nana' (Japanese White Pine) A tight, irregular growing, semi-dwarf conifer with a good blue cast. Because of its upright habit, it makes a good campanion for the many rounded or flat-topped forms of dwarf conifers. A 10 year old plant will be less than 4' tall and approximately 2' wide. parviflora ‘Machinoku’ New 2019 Description to be posted. parviflora ‘Tani mano uki’ (Japanese Snow Pine) Low, rounded and mounding form with brilliant white variegated needles in spring, mainly at the branch tips. And, as if the white needles weren’t enough, there are pink candles in spring that complete the eye-catching display. Variegation persists through most of the season. Very slow growing, 1”-2” per year, reaching 2’-3’ in ten years. Worthy of prominent display as accent in conifer plantings, rock gardens, large trough and decorative containers. Will ignite interest wherever it’s featured in the landscape! pumila ‘Blue Dwarf’ (Dwarf Siberian Pine) A spreading, dense, horizontal form with outstanding blue color, and bright, rose/purple cones in spring that contrast nicely with the blue needles. Slow growing, in 10yrs. reaching a height of 2-3’ with a 6’ spread. For average, reasonably moist, well drained soil. Tolerant of soil types. Does not like hot, humid summers and performs best in colder climates, zone 4 (3). strobus ‘Horsford’ One of the best cushion-forming, dwarf pines. Habit is always tight, compact and plants almost never exceed 5ft. in height by 5ft. wide. ‘Growth rate is very slow, usually no more than 2ins. per year. Originated as a witches’-broom found in Vermont. A choice dwarf conifer, considered rare. sylvestris ‘Glauca Globosa’ A dwarf Scots Pine, slow-growing with a distinct rounded shape with all branches ascending. Short, blue needles offer great color and textural interest. Grows slowly into an attractive dense, broad-upright form, small enough to make a great contribution to foundation plantings, mixed perennial beds and in combinations with evergreen and diciduous shrubs of comparable size. In 10 yrs. plants will be 2-3' high and wide. sylvestris ‘Hillside Creeper’ Low-growing and wide-spreading. Fast growing, ultimately reaching 1½’-2’ high by 8’-10’ wide. A distinctive evergreen suitable for specimen siting, for facing down shrub borders, as anchors in larger rock gardens and especially effective planted on slopes and banks. Tolerant of poor soil but likes acid conditions, full sun. It took me a while to warm up to this pine but it’s now one of my favorites. Regular, judicious pruning definitely works to slow it down and tighten it up, making it a handsome, ground covering subject for larger spaces. sylvestris ‘Moseri’ New 2019 A dwarf Scotch Pine, 3-4’ tall by 2-2½’ wide in 10 yrs. Summer needles are mid-green, turning golden yellow in winter. Develops a husky, densely branched mound, broad at the base, tapering only slightly to form a Hershey’s chocolate drop or egg-shaped silhouette, (too many Super Bowl snacks). Its small accommodating size and its year round good looks, especially the golden winter foliage, commend it for showplace siting just about anywhere in the sunny, well-drained,(not dry), landscape. Zone 3. Sciadopitys verticilata (Japanese Umbrella-pine) An imposing, pyramidal conifer with long, polished, dark green needles, very distinctive, occurring in whorles at intervals along the stems. Branches are held horizontally and, just as the needles encircle the stems, so also the branches occur in whorls at regular intervals along the trunk. Height is anywhere from 30'-60', in time possibly more. Requires rich, moist, acidic soil and sun and, wherever possible, protection form wind. A very desirable tree whose distinctive whorled patterns and lush foliage impart an exotic, almost tropical appearance. Zone 5.
verticilata ‘Joe Kozey’ New 2019 A distinctive Japanese Umbrella Pine with a tight, narrow, upright form, slow growing to 15’ in ten years and twice that height at maturity. Another great introduction by Sydney Waxman of the University of Conn.
verticilata ‘Ossorio’s Gold’ A rare, sought after form with needles that are entirely golden yellow. Small and slow growing, only 4’ tall by 3’ wide after 10 years. Like all Umbrella Pines, It prefers rich, moist but well-drained soil in full sun. Will tolerate some shade. Whenever possible avoid siting in windy locations. Zone 5.
verticilata ‘Slim Jim’ New 2019 Description to be posted. Sciadopitys verticilata ‘Wintergreen’ (Japanese umbrella-pine) Long, dense, glossy needles on plants with a narrow conical form, distinctly more narrow than the species. Needles do not yellow in winter. A very imposing specimen and accent plant. 30-50’ tall. Slow growing at a rate of 9” a year. This selection of the umbrella-pine does well in colder climates. Locally, there are beautiful specimens to be seen on the campuses of Amherst and Smith college. Zone 5. Taxus x media ‘Viridis’ The specimen in picture is the object of much attention throughout the season. It’s slow-growing, tight, upright form, 10-12ft. high by only 2-3ft. wide, is one of the main features of our borders. It gains in appeal and, after fifteen years of enjoying it in the garden, I like it more each year. Foliage is lighter green than the species. Can’t be beat for strong vertical accent. Few pest or disease problems. Zone 4. Thuja Anna’s Magic Ball (occidentalis) A dwarf golden arborvitae that fills many voids in the landscape. Forms a bright golden, evergreen ball that resists burning and holds its color nicely in winter, 15”-20” tall with an equal spread. Contrasts beautiful with blue and green needled dwarf evergreens. Very hardy, zone 3. 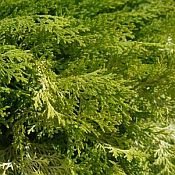 Thuja Fluffy® (plicata) New 2019 A unique, dwarf arborvitae with glossy, golden, fluffy foliage, burn resistant. Maintains excellent winter color and a tight pyramidal habit. 5-10’ tall. Zone 5. Thuja Mr. Bowling Ball® (occidentalis) (aka ‘Limesville’) A dwarf, mounded globe with soft, silvery-blue juvenile foliage, (retains the juvenile foliage over its life span). Habit is ball-shaped, tight and compact, slow growing to a mature size of 3’ tall by 3’ wide in 10 yrs. Ideally suited to foundation plantings and mixed perennial and shrub borders. Its tight, globe shape and silvery blue color create architectural accent, especially when planted in groups. For sun with average soil. Zone 4. Thuja Pancake (occidentalis) No pruning required to maintain the flattened shape of this distinctive little arborvitae, only 1’ tall by 2’-3’ tall. Forms an cute bun of soft, blue toned foliage that persists into winter. Adds an interesting color, texture and form to foundation plantings and at the front of shrub borders. It’s also right at home in the mixed perennial border. Zone 3. 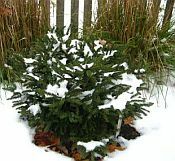 Thuja Tater Tot (occidentalis) New 2019 A dwarf globe arbovitae, slightly taller than wide, with swirling fans of dark green foliage. Fast growing, hardy, burn resistant, makes a neat, tidy container plant. Perfect for rock gardens and for tucking into any small space. 1-2’ tall Zone 3. 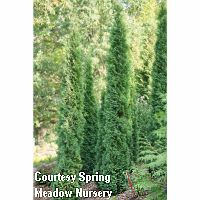 Thuja Thin Man (occidentalis) New 2019 Very narrow growing, 12-15’ tall by only 3-5’ tall at maturity. Holds its green color through winter. For distinctive accent, drawing the eye to wherever it’s sited in the landscape. Impressive planted in clusters, used as narrow hedging and for adding a dramatic presence in the perennial and shrub border. Whenever possible, should be placed with some protection form winter wind. Sun to part shade. Zone 3. © 2018 Bay State Perennial Farm - No unauthorized use allowed - All rights reserved.